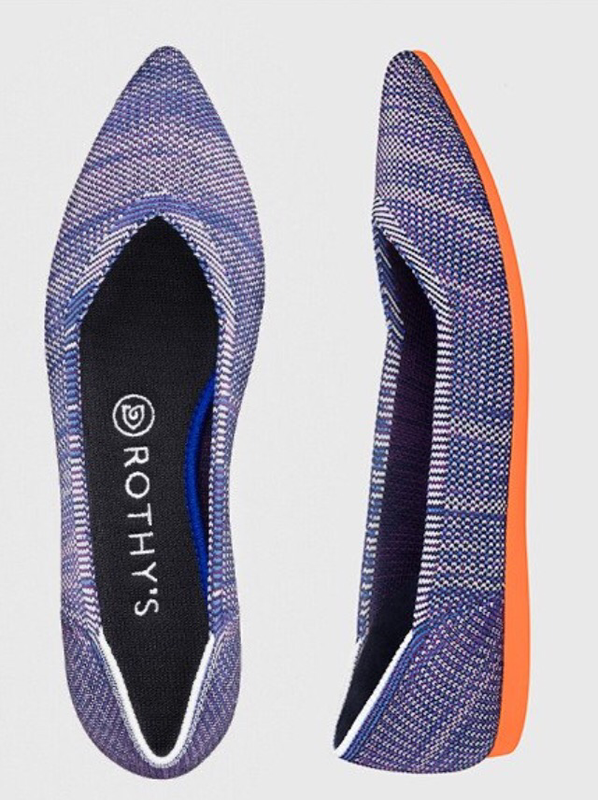 I’m sure you’ve seen ads on your social media feed for Rothy’s shoes. I was intrigued by their use of recycled materials, and of course, the designs are adorable, but I was waiting to hear from a “real person” who had tried them. Enter my office mate, sporting a cute pair of these eco-conscious shoes. She said, she loves them, and while she usually wears sneakers, she found Rothy’s really comfortable for a ballet flat. I tried two styles – The Flat and The Point, and I ended up keeping The Flat. Keep reading for a full review! The Flat in Charcoal Birdseye: Style: I love that the grey goes with almost everything, and the little peek of pink makes them feel unique! Fit: These are true to size for me, perhaps a tiny bit snug, but I think a larger size would be too big. Comfort: For me, these were as comfortable as advertised! No rubbing or blisters at all. Because the material is a knit, there is a little spring to the shoe that feels both supportive and soft. Size: The Point style ran small for me. My usual size was too tight. Comfort: a bit hard for me to rate, because they were tight, but they have that same supportive stretchy feel, so I would expect them to be comfortable, if the style and fit are right for you. Bottom line: as the owner (guardian?) of way too many ballet flats, I am really excited by these shoes which are very comfortable and have just enough details to feel special but are still neutral enough to go with almost anything!